When he was a teenager, Dr Colenbrander felt naturally drawn to the field of dentistry. He likes the fact that dentistry is a melding of art and science and enjoys helping people enhance their smiles. In practice since 1979, Dr Colenbrander has a Bachelor of Dental Surgery from the University of Otago. CAD/CAM porcelain work, creating crowns at a single visit without the need for impressions. Orthodontics using fixed and removable appliances including Invisalign. The various courses he has taken have equipped Dr Colenbrander with the knowledge and skills necessary to enhance his patients’ smiles. Dr Colenbrander is also a member of both The New Zealand Dental Association and The New Zealand Dentists Orthodontic Society. 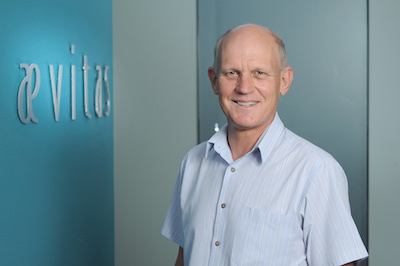 When he’s not at Aevitas Dentistry, Dr Colenbrander stays active as an avid road cyclist. He has competed in various national championships. Experience exceptional dental care and enjoy a beautiful smile! Contact Aevitas Dentistry today to book an appointment with Dr Colenbrander!